Anyone who has had a problem with mice knows that they can get into anything, squeeze through any hole, always find a way in. Mice can be very small and their bone structure allows them to get into spaces that most would think is impossible to pass through. Still, any camper can be made secure and with the right modifications the camper will remain mouse-free for the winter. Mice seek shelter in winter; a camper can make a good home. Take everything out of the camper. This will give the owner a clear view of all the nooks and spaces where a mouse could enter from. Examine the entire inside of the camper for holes or cracks where a mouse could get in. Seal any cracks with caulk. Check the outside of the camper. Look for cracks, holes and other entry points for the mouse. Go systematically side by side. Check both the roof and under the car in the case of a motor-home. Seal where necessary. Check all the windows to make sure they shut tightly. Check the ventilation, plumbing and exhaust systems. This is where the mouse is likely getting in from. Apply a fine wire mesh cover over the exhaust pipes and all ventilation pipes. Close off all water pipes to the camper as well. If there are open faucets and drains on the outside of the camper, seal them shut. Hook up several sonic pest repellent devices in the camper. 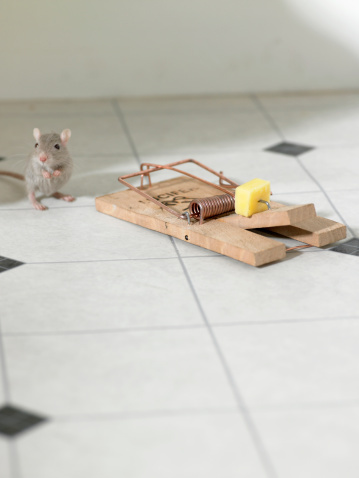 These devices emit a loud high-frequency sound that is unbearable for mice and other rodents. If pets (cats and dogs) will play near the camper make sure the type of pest repellent indicates that it is not harmful for cats and dogs. Rodents can hear higher audio frequencies than both cats and dogs; as such, most pest repellent systems are out of range for cat and dog hearing. Run an extension cord to the camper to power the sonic pest repellent system.